Free Riga is an organisation that repurposes and finds temporary uses for the many abandoned buildings in the Latvian capital. We profiled them last year on Deep Baltic in an article about how Riga is dealing with the steep decline in its population over the last 25 years. Now Free Riga tell us about their latest project; not just regenerating a house, but putting a whole district back on the map. The name of the area is Lastādija, and it’s where you can find T17, Free Riga’s latest renovated house, but even Rigans will often think of it as just a part of the rough inner-city district of Maskavas forštate. First Mārcis Rubenis tells us about Lastādija’s long history, and then Anna Štefane fills us in on how people involved in T17 are interacting with the community. Lastādija or Lastadie is the forgotten name of the neighbourhood bounded by the Central Market, the railway, Lāčplēša Street and the Daugava river. The name is first mentioned in written sources in 1348. It was an active, multicultural and growing suburb of traders between the fortifications of Old Riga and the second line of fortifications, which went along what is now Dzirnavu and Lāčplēša streets. Until the 19th century this was the main port of Riga, a Hanseatic city located on the major trade route from the Black Sea to Northern Europe, which ran along the Daugava and Dnieper waterways. Not surprisingly, this provided development for the whole area behind the city wall – similarly to Venice where the main driver of life was trade. The name of the neighbourhood stems from the Old German “Last”, meaning “cargo”. The name can also be found in other Hanseatic cities, indicating a connection with the loading and unloading of ships. Here settled Russian traders, as well as serfs who had run away from their lords in the countryside, Jews and others whom Riga didn’t allow to settle within its borders. Here was the Russian Yard, a market complex where Russian trader families gained wealth, later giving rise to many renowned artists. Here the famous Soviet sculptor Vera Muhina was born, the author of the “Granonka” glass design, as well as the statue “Worker and Kolhoz Woman”. As legend tells, Muhina used her influence to save the Freedom Monument in Riga, the work of her friend the sculptor Kārlis Zāle, from being demolished during the Soviet times. Here Russian poet Irina Odoevceva was born, the inheritor of the majestic house at 4/6 Gogoļa Street. In the early ’20s, she lived between Riga, Soviet St. Petersburg and Paris. Here without any prejudices mixed wealthy Baltic German, Russian and Latvian families. Probably this could be called the neighborhood of explorers and “self-made men”, where those marginalised in the city made their fortunes by themselves. It’s also “an unknown territory with interesting neighbours, empty buildings – full of potential… We needed to find new name to avoid this sense of it being a “black hole”, and to show people that this district has an interesting milieu and we found this – old port area, back in time called Lastādija” said Marcis Rubenis, one of the longest-standing members of Free Riga. “For me Lastādija is really a beautiful name – it reminds me of a woman’s first name, maybe from the Orthodox calendar”, says Ieva Lange, who lived in T17 for around a year. Linda thinks Lastādija has “a real character – perhaps like a real woman from Maskačka [Maskavas forštate]. I think it is important that there is a name for this place; otherwise, it is a bit of a no-place or an in-between-place, a nowhere land. And this name does that – allows a identity for this place – good or bad, but a name, not just a post code number or a spot on a map. I hope that people who also live in this neighborhood can start to feel it as their place – a place in their hearts”. In her main book on urbanism, The Death and Life of Great American Cities, Jane Jacobs wrote about one particular district – North-End in Boston, sometime in the early ’50s. North-End in the mind of society was like a slum, the “disgrace of the city”. But within ten years all the mattresses in windows were replaced with new louvre-boards and untouched paint. However, in people’s memory it was still this slum and disgrace, although all the locals had good feelings of security and ownership. This potential, contrast and wabi-sabi effects – main things, which gather people together – initiators from Free Riga and residents with different values and skills. They all like the contrast in which this area stands and don’t want to “lose its character, even if that means sticking with some ‘bad’ traits – that is what makes it special”, think Linda. It means also not to become the “big bad gentrificators”, but instead to think about how to create a feeling of ownership in this area between locals. And it is a really “sweet” district for living – “it is all near – the market, Maxima, Rimi [supermarkets], Latgalīte (an old flea market which sells a bunch of different stuff), Depo – everything you need for living”, says Krišjānis Zariņš, the man with gifted hands and a bright head. He is the engineer of Lastādija, a guy who can do DIY day and night and make diamonds from the crap. For him, it’s mostly about what he can do with his hands: he wants to rescue and build excellent and bright things from things that others have left there. Most of the seven people who currently live in T17 grew up in other districts of Riga – from Zolitūde to Ķengarags – but in some cases they are from different towns. For example, Alise Ziemule, the pioneer of Free Riga movement, grew up in Strenči – a small town in Vidzeme. For her it is interesting to learn how people grow up and were raised in this area. How it feels, when you start to live here. “I’m from a small place, where everything is clear – this is my home, my places, my yard. But here, it was really exiting to understand how my everyday life starts to subdue this area – with the market, central station, bus terminal – how it feels when it’s mine… All areas have layers; it’s the same here. The central train station, strangers, the largest amount of passers-by in the country – it’s all on the surface. However, when you try to look closer – in all places, something happens and you can dig, dig and dig. Current resources, historical contexts, stories about people – they are all things that you can comprehend, combine, use and understand. It is the biggest resource of the district. You have a lot of aspects which go to create the area”. The first encounters with the locals and deeper digging took place during the project “Meeting with Lastādija”. 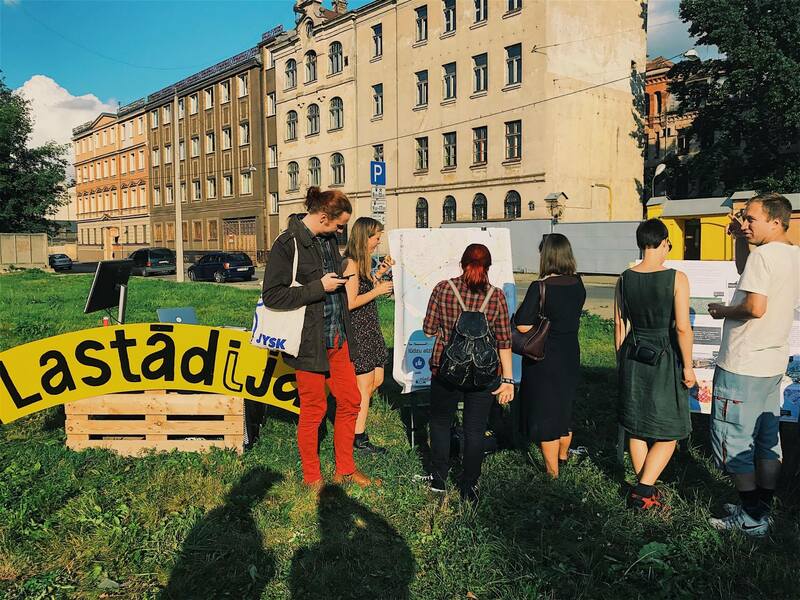 Students of Anthropology, along with Free Riga members, started to collect stories for a map, annotated with current “tales” from Lastādija, about places and the people who live there. “I like to say ‘hello!’ to the neighbours on the streets, be aware who among them I should call for consultations, recognise workers from different institutions and know all the names of the local street cats”, says Ieva, one of main people in the project, thanks to whom two editions of these maps exist. As a result, Free Riga projects and participants started to expand and advance. In August 2017, an important event was held — “the picnic with the neighbourhood”. The main idea was to give people who live and create here space and time to show what they’ve got, give them one day where they can express themselves and meet each other. “We all held this “picnic” and somehow we interrupted this milieu. However, the main thing is: you see how fantasy becomes reality, because of this ‘intervention'”, said Mārcis. “We also wanted to understand – are people interested in this kind of ownership and participation? And, yeah, I mean, some gopniks sat on the towels, children played board games and artists from Dauga Spirit raised a dome from colorful fabrics and created a “chill zone”. It doesn’t have to be organised – people came and somehow self-organised this circle themselves”, says Anna Štefane, formerly a journalist and now a new member of Free Riga. For now, Free Riga is growing bigger in this very district – two new houses down the street, garages and one very big field. This field is so vast, so it could be divided into different parts – one for urban gardening, one for festivals, one maybe for a small skate park, etc. People from Free Riga want to gather more neighbours together and find new residents, craftsmen, artists, activists and non-profit organisations to fill this “black hole” of potential. “For me, as a former journalist, it was important to find this feeling of freedom between the capitalistic and the post-Soviet world with its poor social help, damaged generations of the ’90s, the influence of American economics, the crisis, slow understanding of what European values mean. I found this freedom here, piled in a “trashy” neighborhood, which I have loved since my early adulthood. It’s kind of silly, but maybe, it’s the first time in my life when I feel this – some ideas (dreams) could come true, because I have this feeling of ownership and I believe that we can create something here and work for an idea – living in a new way, in a brave new world”, says Anna.